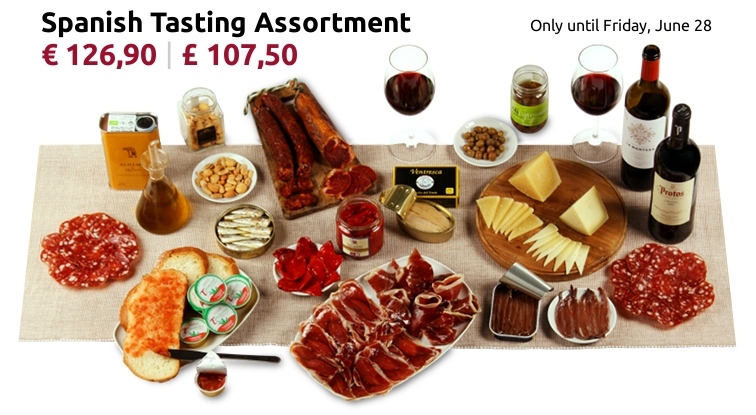 Organize a Spanish supper - Today and tomorrow only! Would you like to organize a meal with a Spanish flavor? IberGour makes it easy. This month we suggest a tasting assortment with a selection of Spanish gourmet products so you can invite 5 to 6 people to your table. This haute cuisine combination gives you the opportunity to taste wine from two of the most renowned DOs in Spain (Rioja and Ribera del Duero), compare the aromatic power of 5 Jotas Jabugo ham with the subtleness and sweetness of Guijuelo ham, travel to the Bay of Biscay when you taste authentic Santoña anchovy fillets, appreciate the delicacy of piquillo peppers from Navarre and the slight tang of raw sheep's milk cheese. A total of 17 products from around Spain, including stewed tomatoes and extra virgin olive oil so you can prepare bread slices with tomato, the best thing to accompany cheese and sausages. All ready to serve and enjoy. All you have to do is set the table and add some bread. Bon appetit! If you observe that a piece is faulty when you start consuming it, we will exchange it for another, or it will be refunded in full (more on our return policy). If you prefer not to receive emails like this one you can reply to this message with "Remove" in the body and we will remove you from the list.